The products shown below are some examples of customized developments. Perhaps you will find here some ideas for your own application. If you are looking for something else, please contact us and tell us your request. Metra will react flexibly to your demand and provide a quick and economic solution. We are at your disposal with the expertise from over 40 years in the field of vibration measurement. Model EM1000 is a reference shaker providing a sinusoidal vibration signal of 1000 Hz and 2 m/s² (±5 %). It was designed to check the probe accelerometer KST94. Therefore it has the shape of the contactors which are tested with the KST94. The EM1000 is regularly channeled into the production line to check the noise detection system. It can also be used to recalibrate the measuring chain since it provides a precise and load independent vibration signal. The vibration exciter used for the EM1000 is a piezoelectric actuator. A built-in accelerometer with reference loop keeps the vibration level constant. The small case (45 mm x 55 mm x 75 mm) includes the complete circuit with generator, reference loop and power regulation. This product was developed for quality control in a continuous cast process of a steel plant. While the liquid steel is poured in, the mould has to perform an up-and-down oscillation with a frequency of 1 to 3 Hz to keep friction between the strand surface and the mould walls under a critical limit. The oscillation of the mould weighing several tons is usually generated by a powerful eccentric drive. In case of wear unwanted mould oscillations in transverse direction may occur which may affect the quality of the produced strand. Therefore it is important to measure in regular intervals mould oscillation in main (Z) and transverse direction (X/Y). The Mould Oscillation Measuring System consists of a triaxial piezoelectric accelerometer with high sensitivity and a rugged industrial notebook PC with built-in data acquisition board. The sensor is placed on top of the mould. Adjustable feet and a level are provided for axis alignment. The PC screen shows the displacement values for each direction and oscillation curves. The resolution of the measuring system is 0.1 mm with 5 % accuracy. This signal conditioner was developed for Dewetron (Austria). It belongs to a wide range of sensor conditioner modules for PC based data acquisition systems. The DAQ-CHARGE module is suited for both charge and IEPE compatible vibration transducers. It features 5 gain ranges, 2 integrators, 3 high pass filters and 5 low pass filters. Transducer sensitivity is programmable. All settings can be made either by pushbuttons and LEDs ore via a RS-485 interface. The DAQ-CHARGE module is characterized by versatility and smallest dimensions. This device is used as a front end for mobile machine vibration measurement with a notebook PC. It is connected to a PCMCIA data acquisition card which also provides the supply voltage. 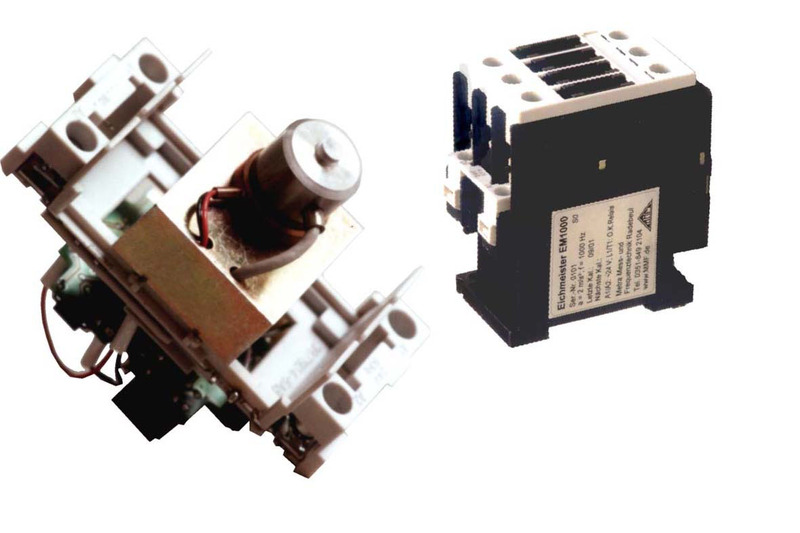 Four Low Power IEPE transducers can be connected. The signal may be amplified and filtered using FB2 low pass modules. This sensor was developed for the ground borne sound locating device Digiphone of Hagenuk KMT. The unit is intended for pinpointing faults of power cables. It detects ground vibrations which are generated by flash-over faults using the sound field and distance method. The sensor measures both vibration and magnetic fields. It contains the electronic circuit for amplification and filtering. Its plastic case with handle was designed for field use. Different accessories are supplied for optimum adaptation of the sensor and different surfaces. This instrument was developed for a manufacturer of floor coverings in order to measure footstep sound insulation to ISO 140 or DIN 52210. It generates a reproducible shock impulse onto a sample of the floor covering and measures the resulting shock acceleration. This sensor was developed for the detection of bullet impacts on shooting ranges. Its main properties are a robust design and a very low price. Sensitivity is 25 mV/g. The 3 dB frequency range extends from 3 Hz to 5 kHz. The resonance frequency is at 9 kHz. The sensor is mounted by an integral M8 stud. The photograph shows a typical example of a customized packaging of the vibration monitor M12. The case additionally includes a 24 VDC power supply, an LED bar graph display and a second alarm LED with manual reset function. This product was designed as an ice collision warning system for the propellers of an icebreaker. This very compact sensor conditioning module was designed for a frequency analyzer. It provides from a 5V supply the IEPE constant current, four digitally selectable gain ranges and a four-pole low pass filter.